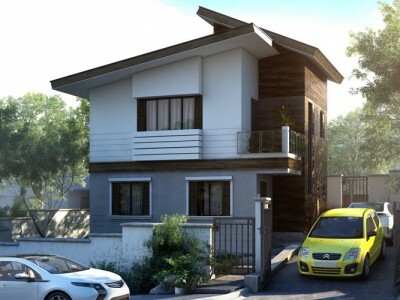 Juliana is a two story Modern House Design which is part of our low budget houses catered for middle income families. As basic necessity of every family, there are various organizations who offer financial assistance to families who want to avail housing. 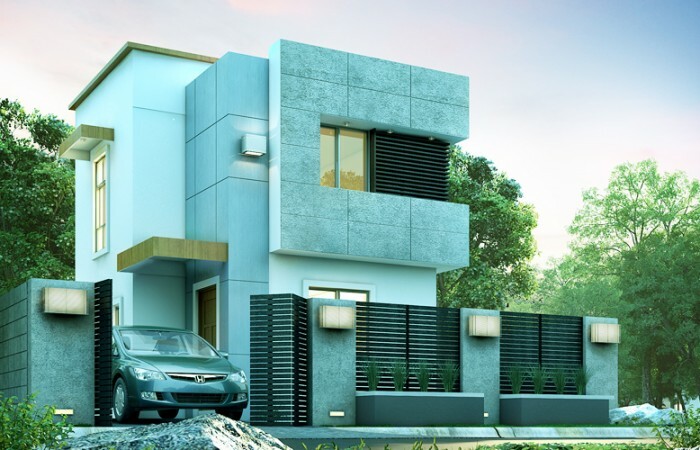 There are also a lot of subdivision developing projects everywhere around the country, the availabilities of areas and lot sizes cater every family of various income levels. This plan is designed for a small lot area but can be made a little spacious by converting it into a two story residence. 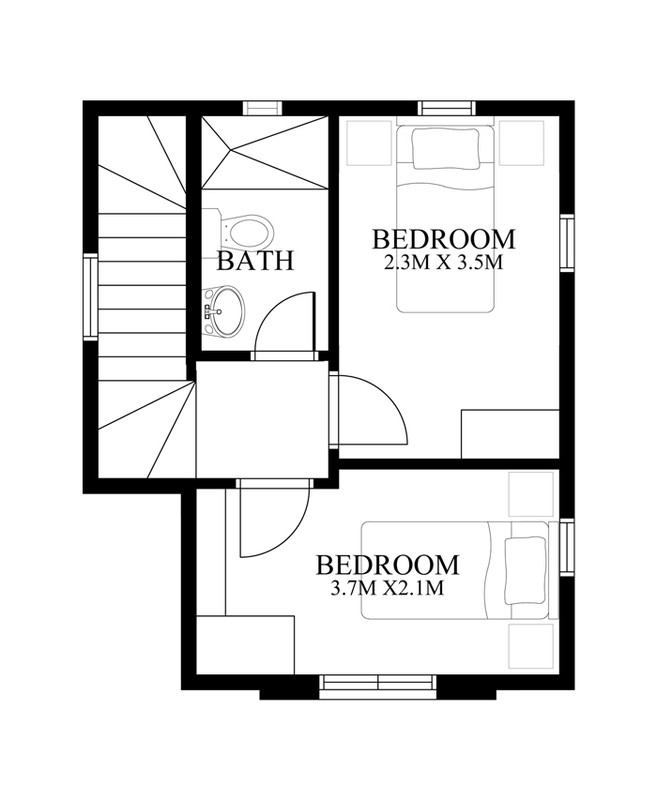 The floor area of this is only 58 m² that can be built in a lot area of 98 m². 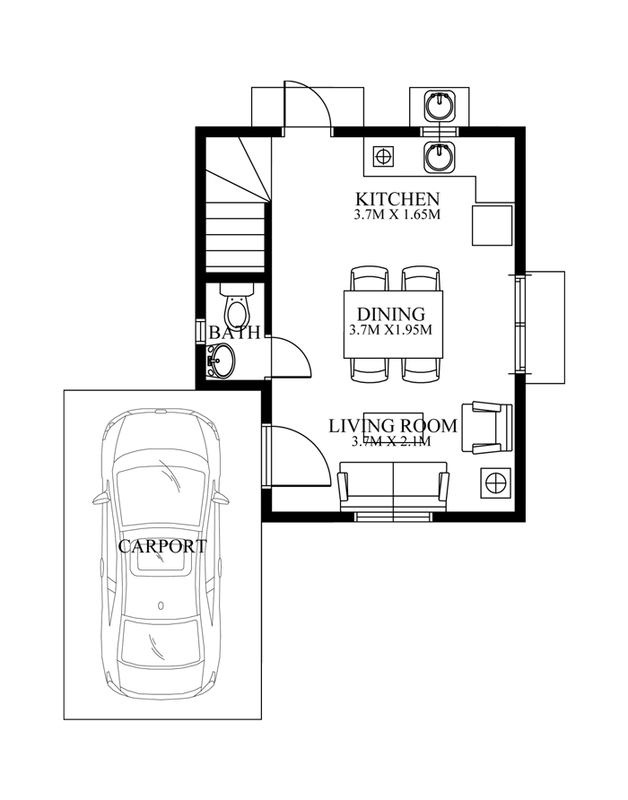 This design is adequate to occupy the basic requirements of a house with considerable space for individual functions. 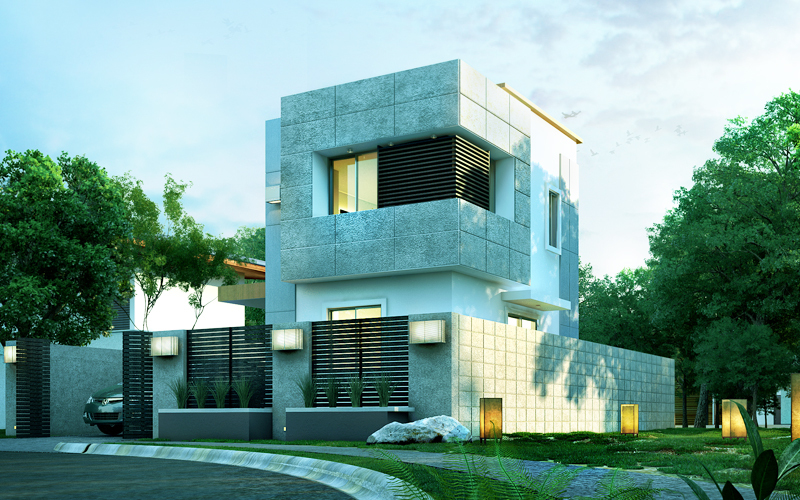 This Modern House has the following features: Concrete dominated walls, aluminum glass windows as opening for air and light requirements, a garage, steel fence in the front and a concrete wall on the right side for security purposes and a matching light system that provides additional aesthetics to the design. The entry starts from the garage to the living room. The dining room and kitchen are laid out adjacent to each other, not so much space separates them due to the limitation of area. A toilet and bath is provided in the first floor below the staircase to serve the purpose. The second floor is designed just to contain two bedrooms of average sizes, each of which has walk-in-closet and a common bath shared by two bedroom suites. The floor area used on this lot area has allowed this Modern House Design to sit in a place with a little more area around the perimeter of the house casual zone that can also accommodate guests for common gatherings at back of the carport. The limitation of the floor area has the living spaces built with strong connection among each function. As small service area is provided at the back to support the kitchen for its activities. 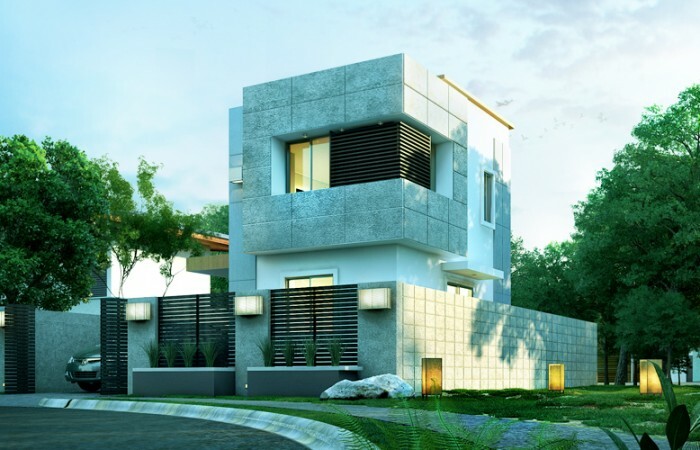 The overall appearance of the building looks very compact and strong as defined by the concrete wall used in almost 80% of the elevation and the heavy constructed perimeter fencing around the house. 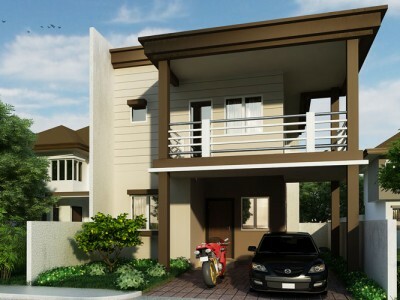 This Modern House Design can be considered a suggested design for places frequented by earthquake, typhoons and other calamities, but not limited to, as it can also be a good shelter to build in any type of subdivision or housing properties and locations. The overall view looks so unique and well-designed. 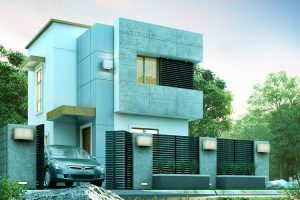 Considering the current economic situation of the country, this house model will fit the choice of middle income families and for average-size families who wants to enjoy the fact of having a home of their own. 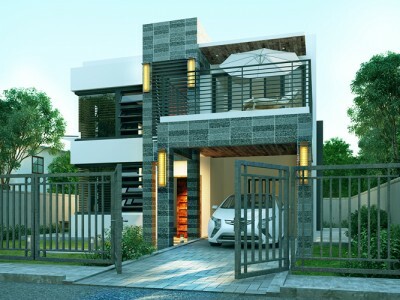 The maintenance requirement of this Modern House Design is not too heavy to the shoulders of the owner.